DURANGO, Colo. — For the first time since territorial days, rain will be free for the catching here, as more and more thirsty states part ways with one of the most entrenched codes of the West. Janine Fitzgerald, associate professor of sociology at Fort Lewis College in Durango, Colo., depends on rainwater and solar power. Tom Bartels of Durango said he had been “so willing to go to jail” for catching water on his roof and watering his garden. Watering a lawn in Durango, Colo.
Who owns the sky, anyway? In most of the country, that is a question for philosophy class or bad poetry. In the West, lawyers parse it with straight faces and serious intent. The result, especially stark here in the Four Corners area of Arizona, Colorado, New Mexico and Utah, is a crazy quilt of rules and regulations — and an entire subculture of people like Mr. Bartels who have been using the rain nature provided but laws forbade. The two Colorado laws allow perhaps a quarter-million residents with private wells to begin rainwater harvesting, as well as the setting up of a pilot program for larger scale rain-catching. Just 75 miles west of here, in Utah, collecting rainwater from the roof is still illegal unless the roof owner also owns water rights on the ground; the same rigid rules, with a few local exceptions, also apply in Washington State. Meanwhile, 20 miles south of here, in New Mexico, rainwater catchment, as the collecting is called, is mandatory for new dwellings in some places like Santa Fe. And in Arizona, cities like Tucson are pioneering the practices of big-city rain capture. “All you need for a water harvesting system is rain, and a place to put it,” Tucson Water says on its Web site. Here in Colorado, the old law created a kind of wink-and-nod shadow economy. Rain equipment could be legally sold, but retailers said they knew better than to ask what the buyer intended to do with the product. “It’s like being able to sell things like smoking paraphernalia even though smoking pot is illegal,” said Laurie E. Dickson, who for years sold barrel-and-hose systems from a shop in downtown Durango. State water officials acknowledged that they rarely enforced the old law. With the new laws, the state created a system of fines for rain catchers without a permit; previously the only option was to shut a collector down. But Kevin Rein, Colorado’s assistant state engineer, said enforcement would focus on people who violated water rules on a large scale. “It’s not going to be a situation where we’re sending out people to look in backyards,” Mr. Rein said. Science has also stepped forward to underline how incorrect the old sweeping legal generalizations were. But the deeper questions about rain are what really gnawed at rain harvesters like Todd S. Anderson, a small-scale farmer just east of Durango. Mr. Anderson said catching rain was not just thrifty — he is so water conscious that he has not washed his truck in five years — but also morally correct because it used water that would otherwise be pumped from the ground. For the last year, Mr. Anderson has been catching rainwater that runs off his greenhouse but keeping the barrel hidden from view. When the new law passed, he put the barrel in plain sight, and he plans to set up a system for his house. Dig a little deeper into the rain-catching world, and there are remnants of the 1970s back-to-land hippie culture, which went off the grid into aquatic self-sufficiency long ago. “Our whole perspective on life is to try to use what is available, and to not be dependent on big systems,” said Janine Fitzgerald, whose parents bought land in southwest Colorado in 1970, miles from where the pavement ends. 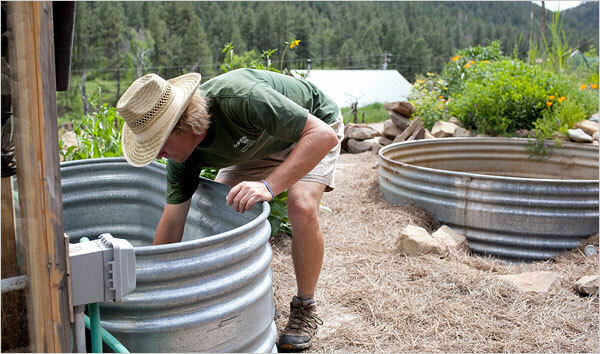 Ms. Fitzgerald, an associate professor of sociology at Fort Lewis College in Durango, still lives the unwired life with her own family now, growing most of her own food and drinking and bathing in filtered rainwater. Rain dependency has its ups and downs, Ms. Fitzgerald said. Her home is also completely solar-powered, which means that the pumps to push water from the rain tanks are solar-powered, too. A cloudy, rainy spring this year was good for tanks, bad for pumps. The economy has turned on some early rainwater believers, too. Ms. Dickson’s company in Durango went out of business last December as the construction market faltered. The rain barrels she once sold will soon be perfectly legal, but the shop is shuttered. “We were ahead of our time,” she said. Precipitation, every last drop or flake, was assigned ownership from the moment it fell in many Western states, making scofflaws of people who scooped rainfall from their own gutters. In=2 0some instances, the rights to that water were assigned a century or more ago. The two Colorado laws allow perhaps a quarter-million residents with private wells to begin rainwater harves ting, as well as the setting up of a pilot program for larger scale rain-catching. And in Arizona, cities like Tucson are pioneering the practices of big-city rain capture. 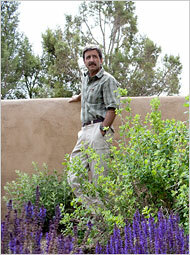 “All you need for a water harvesting system is rain, and a place to put it,” Tucson Watersays on its Web site. A study in 2007 proved crucial to convincing Colorado lawmakers that rain catching would not rob water owners of their rights. It found that in an average year, 97 percen t of the precipitation that fell in Douglas County, near Denver, never got anywhere near a stream. The water evaporated or was used by plants.